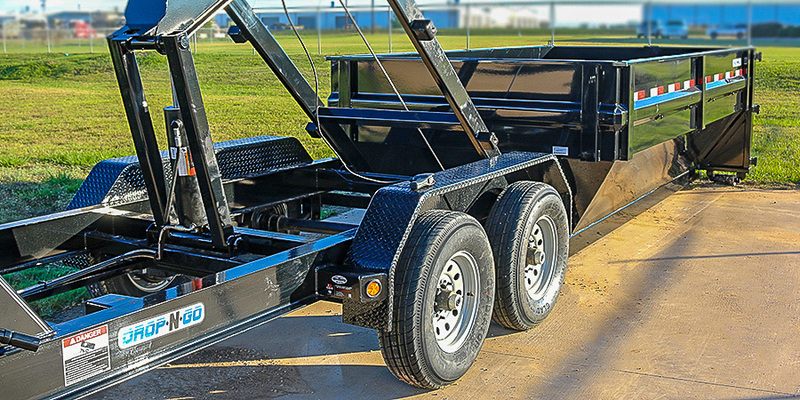 We are proud to introduce the all-new EH equipment hauler. 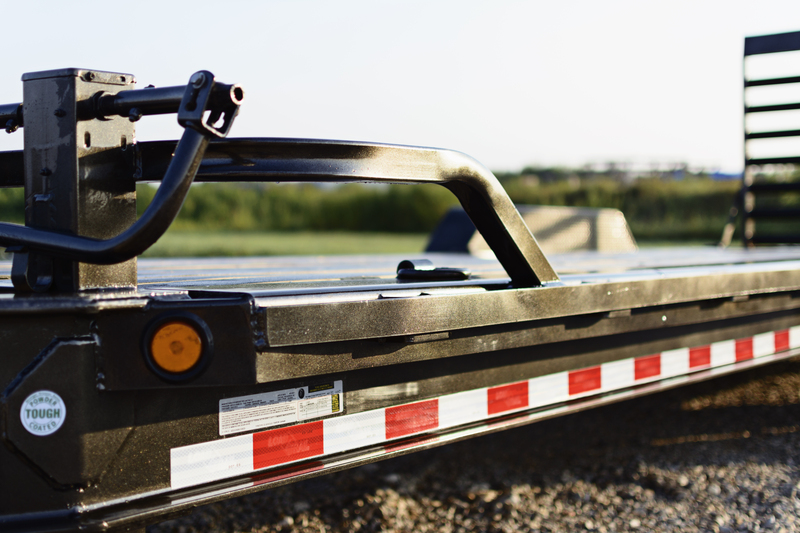 With a 10-inch I-beam frame and tongue, 20,000-pound GVWR, and 8 different lengths to choose from, your heavy equipment hauling just got a lot easier. 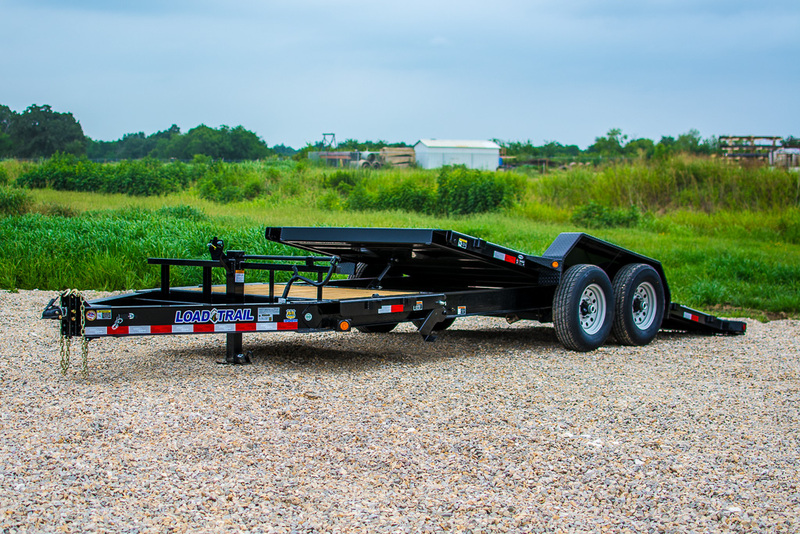 Available in both bumper pull and our similar EG gooseneck model, this trailer rides on 2 10,000-pound Dexter Torsion Axels assembled with electric brakes. 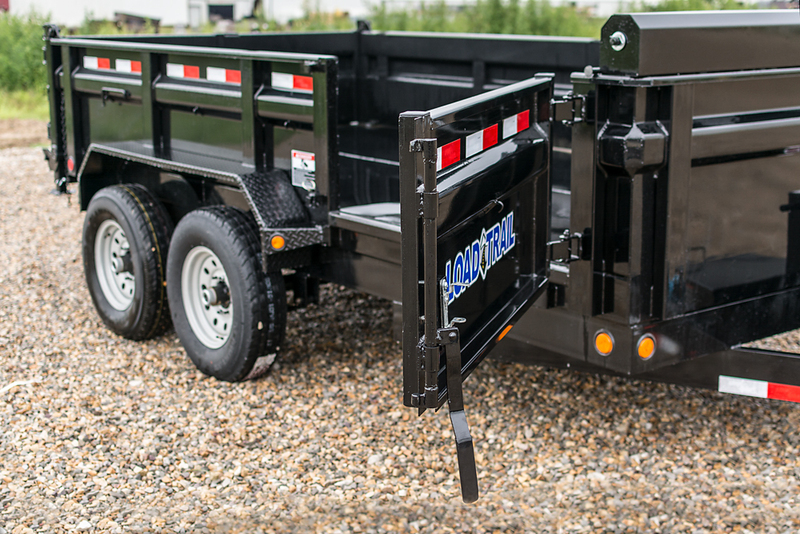 Each EH equipment hauler has an 82-inch wide deck to transport your large haul, and 2 10k spring loaded drop leg jacks to support it. 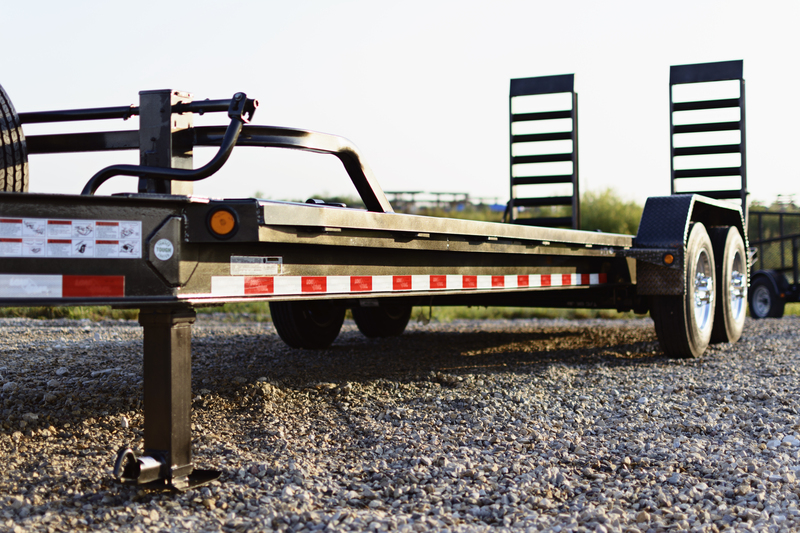 Sometimes when the sun goes down, you don’t. 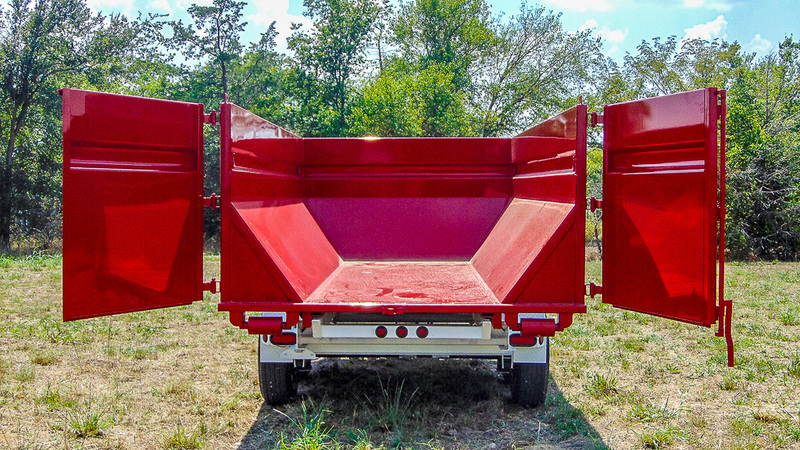 Our EH equipment hauler comes standard with a flush mounted D.O.T. 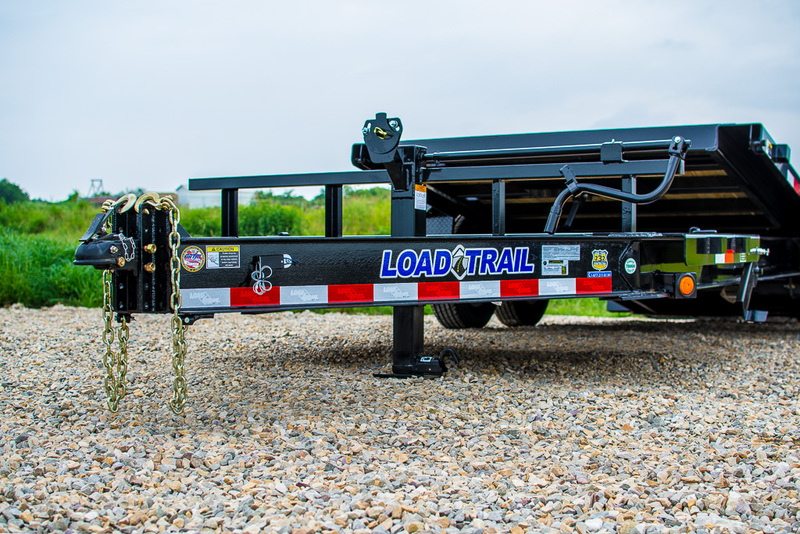 certified LED lighting system to ensure safety, and to keep your hauls that happen outside of regular work hours well lit. 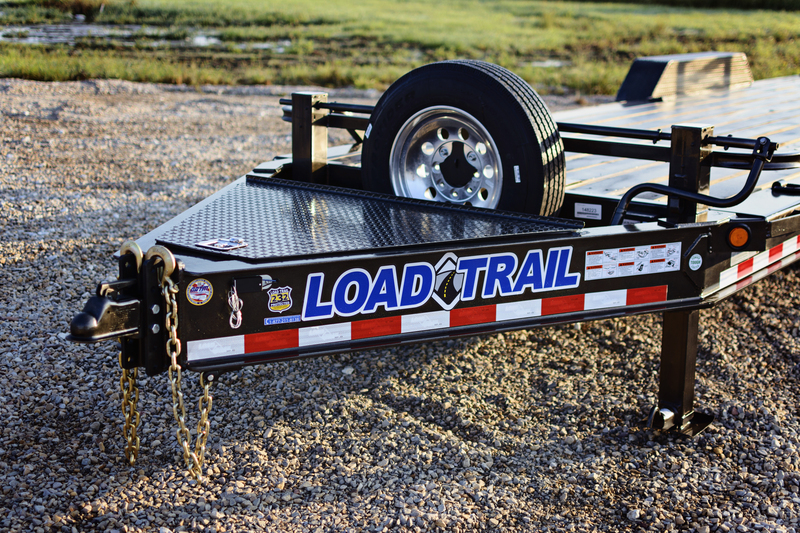 A 2-5/16-inch adjustable auto-lock coupler, emergency breakaway system, and 2 3/8-inch safety chains keep our equipment hauler secure for any pull, and the expanded front tool tray makes storing and accessing all your tools easy and convenient once you get where you’re going. 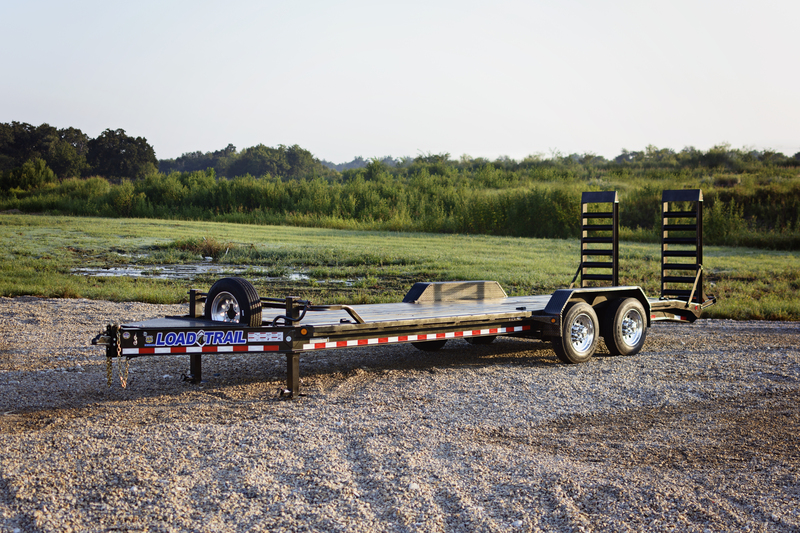 We protect the 17.5-inch wheels with steel diamond plate fenders and floor each trailer deck with treated pine. 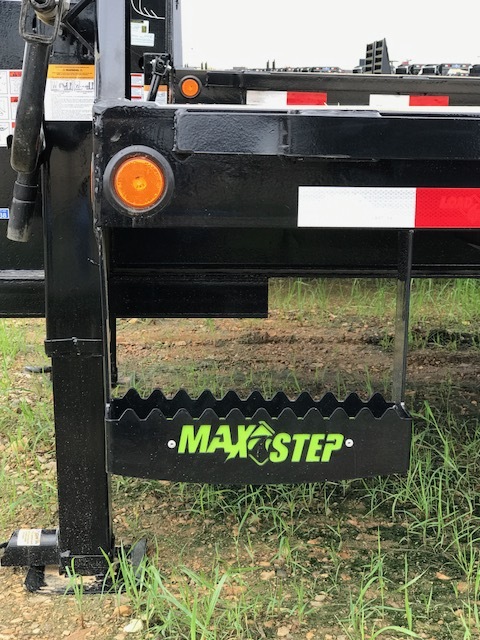 And if you want even more traction and protection for your heavy equipment, our Blackwood rubber infused lumber flooring is just an upgrade away. 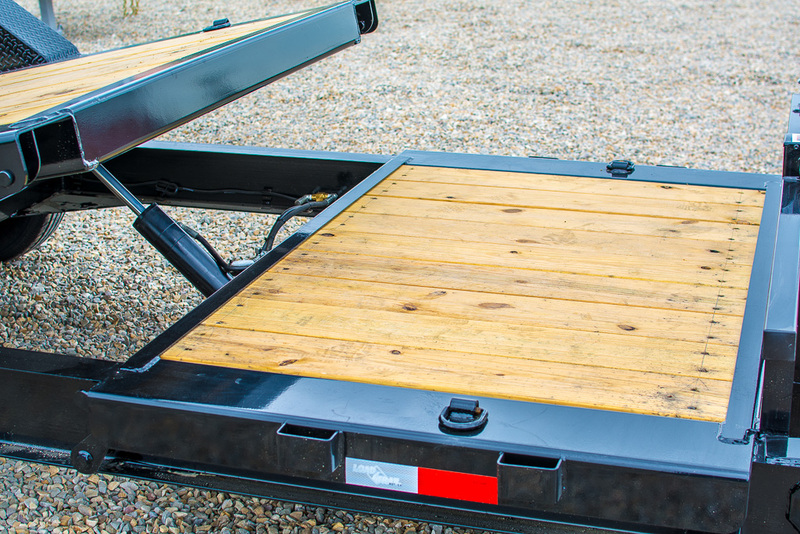 Spend more time working and less time unloading with our 2 5-foot slide-in ramps that come with each EH equipment hauler. 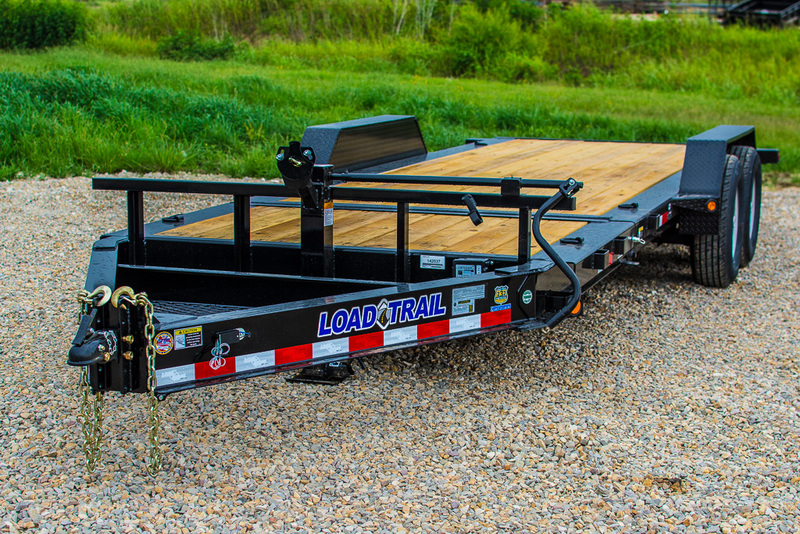 Heavy duty fold-up ramps and a 2-foot dovetail are also available options to make loading smooth and easy. 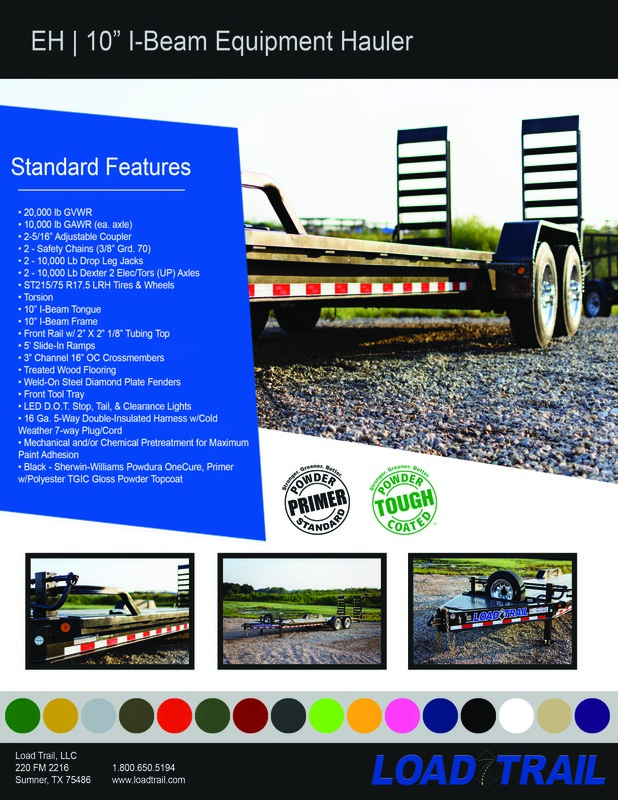 All our trailers are finished with a Sherwin-Williams Powdura Powder Coat so that they look as good they work in 17 different colors. 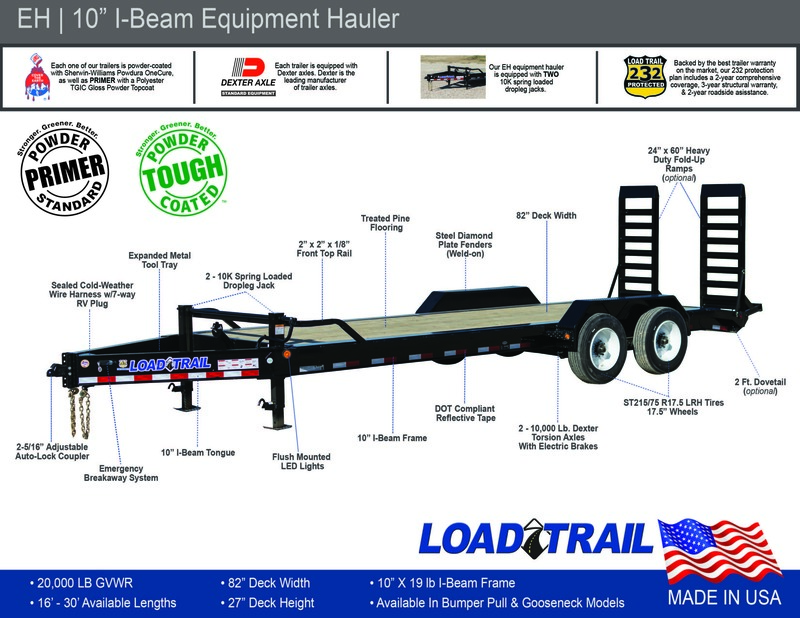 Visit our main website at www.loadtrail.com for more information on our EH equipment hauler as well all our other models. 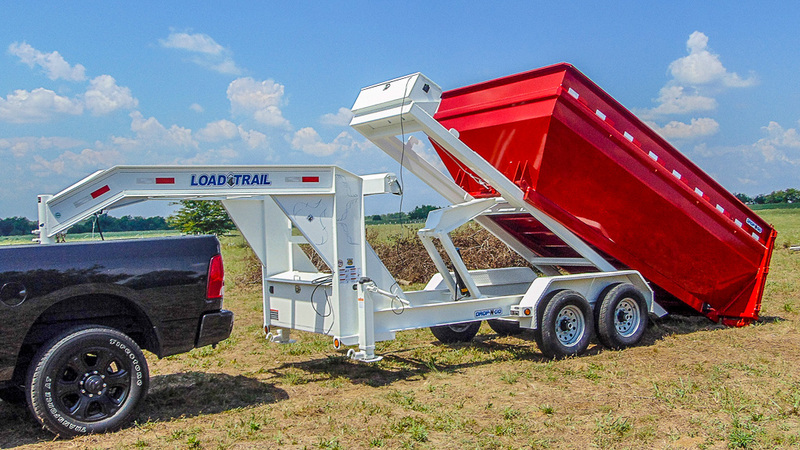 If you have any questions about our products, services, or would like additional information you can contact us at 903-783-3900 or send us an email at info@loadtrail.com.